What do you think are the most important things that need to happen to safeguard and enhance the rich and varied wildlife of the Cairngorms National Park in the next five years? This consultation finished on the 14 September 2018. What did we consult on? The Cairngorms National Park Authority consulted on the draft Cairngorms Nature Action Plan 2018-2023. Cairngorms Nature is a partnership for people and organisations to come together with a common desire to safeguard and enhance the outstanding nature in the Cairngorms National Park. The Action Plan describes the most important things to do over the next five years and provides a focus for the work of partners. 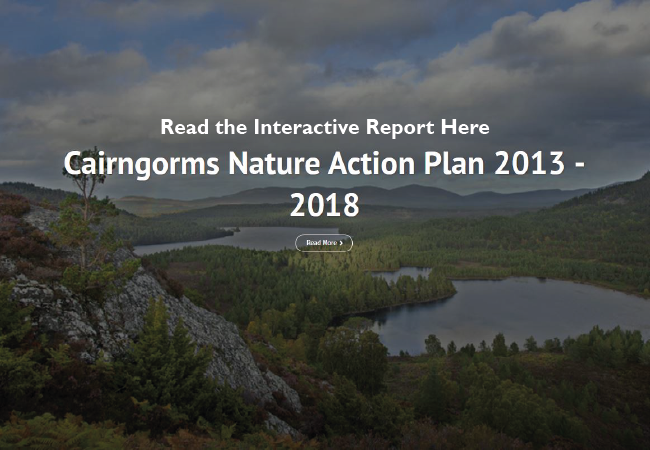 You can view our interactive report on the outcomes of the previous Cairngorms Nature Action Plan to see what progress has been made so far in achieving the 50 year vision between 2013 and 2018.